Today started out on a not-so-great note. I woke up about 10 minutes late, but that's no big deal, so I just rushed and was out the door about 5 minutes later than what I was hoping. I remembered that Addie's seat belt and blanket were in Arsen's car, so I tried to rig her a little set up with a leash. Didn't work the best. After I got her settled in and turned on my car, I was reminded that I was out of gas. Awesome. I stopped to get gas and got back on the road...I was definitely behind schedule, but I could still make it to work about 10 minutes early (I try to get there about 15 minutes early every day, although the past week hasn't been going according to plan). Since she wasn't strapped in the right way, Addie kept going back and forth from my lap to the passenger seat, which was annoying, but nothing too bad. And then the unthinkable happened. She peed in my car. She has never, ever done that before. Ever. I didn't even register what was happening at first. She always spins around several times before she pees, but she also spins before she lays down. I saw her spin, but OF COURSE I assumed she was going to lay down. Nope. She just squatted there, peeing on her blanket, her toys, and my freaking seat belt. I was yelling "Addie STOP! Addie Stop It Right Now! ADDIE!!!! ", and she was just staring at me while she continued to pee. I dropped Addie off, made it to work right after 8...and then decided I would really rather not leave a urine covered blanket, toys, and seat belt to sit in my car all day long in 100 degree heat. I can't even imagine what that would smell like after 10 hours...goodness. So I picked Addie back up a couple hours later, came back home, cleaned everything up, and have been working from home the rest of the day. Of course my mind goes to the worst place...maybe she's sick? That's just not like her. 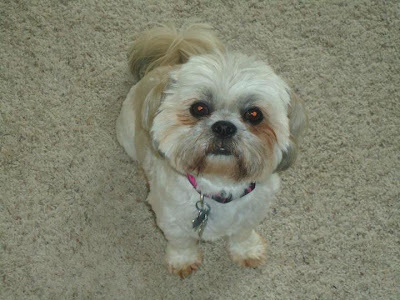 Something has to be wrong...and then my mom sends me an email about shih tzu's being prone to kidney disease. Gooooood Lord. Let the paranoia begin! How could I stay mad at this tiny dog? O man! Sorry your day got off to a rough start!! I have a shih tzu and she was a perfect angel until I had my little boy. Now she pees EVERYWHERE in the house. I feel your pain! OMG!! That sounds like an insane morning! Can't believe you still made it to work on time :) I love that you said men give solutions, not sympathy! That's totally like my husband, they don't understand that we're looking for sympathy. HAHA! Omg!What a little terror! She looks just like my shihtzu Raz! Exacly alike! I found your blog through ruthie hart! You are so cute. And so is your dang dog. But..I would definitely be freaking out! haha! LOL your mom is just as dramatic as mine is! :) Sorry about your morning, Addie is SO cute though! Oh NO! Why do terrible things always come in groups?! So sorry about your morning... Crazy that your pup peed in your car! Poor little thing. One of our dogs gets very carsick, so we have to worry about what comes up the other end. Lovely.- Anyway, so nice to "meet" you! Visiting from the Bloglovin' link party :-) Have a great weekend! Aw I hope Addie is okay! That morning sounds ridiculously hard and I would totally have been crying frustrated tears. And girl I feel you on men, they just are really solution oriented, compared to girls who are all about emotions. I hope everything works out okay! Sending you some hugs!